Time to get the shiny army out. These chaps are mostly coated in chrome or brass paint which makes them super shiny on the battlefield. Some green crystals to decorate the bases with and a few conversions with the lords / crypteks / destroyers / warriors and the flying base. Army pretty much complete - would love a tomb stalker and tesseract vault to round it off one day though. Cheers. Ryza adeptus mechanicus army takes shape. I've finally pulled my finger out and got these guys magnetised and assembled. What started as a single freeblade back when knights were first released has now grown into a small army. I purchased the Renegade box a while back but was never quite sure how to split it - I wanted one knight to be mechanicus and another to be chaos, which left me with my original freeblade. However, the advent of forgebane, the helverins and now a second copy of Renegade (new version) has left me able to still retain a knight each for chaos/mechanicum and still start a knight army. I decided early on that I didn't want a whole knight army painted in the same colour as my ryza mechanicus, and thus I have adopted the colour scheme of my original knight freeblade. This is gold skeleton, black armour with silver trim and flames painted on the panels. I found an airbrush to be relatively useful in getting this done quickly, though my inexperience with it did result in several blockages. Of course, before embarking on a spray-fest I fully magnetised them all. Fluff-wise, these chaps are called the 'Knights of Avalon' and I have used them as Taranis thus far as it fits with what I wanted for them. They are a band of freeblades, exiles, lone survivors and knights who have answered the call. They believe themselves to be on a holy crusade following the Emperor's will as divined by the Imperial Tarot. Upon forsaking their original oaths they repaint their armour - this is to represent the gold of the Emperor encased by black night, and flames to mark his eventual resurrection. They are named for Arthurian legend. 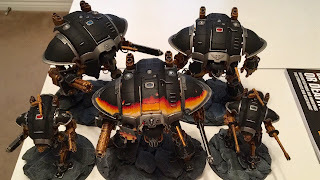 Ultimately I would like 12 Knights, (as in the number who supposedly sat around the round table, though this varies wildly) but am setting a milestone of 10 for end of the year - the last two probably to come when GW updates knights again or from FW. I have 7 thus far and the addition of a valiant, castellan and preceptor with make up the numbers. Only one of them is painted in the flame scheme thus far but more to follow. CHeers. Imperial soup army - Ultra-Mordians. Plus Thousand Sons. Hi all. 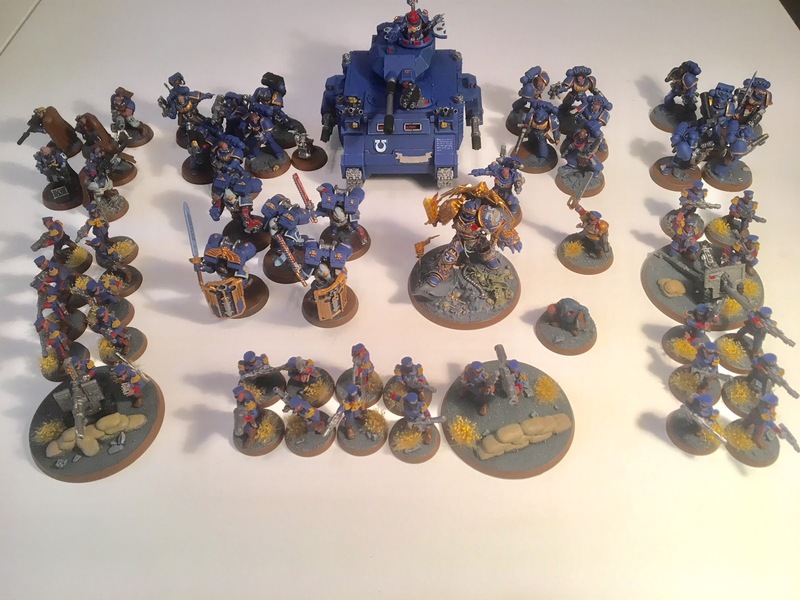 Though technically this isn’t exclusively a non space marine army I just wanted to share it and haven’t updated this blog in a few months. Sidetracking for a moment, I’ve organised a tale of gamers type event at my local club with 12 of us participating, mostly 40k. This is to incentivise is all to regularly commit to painting up and gradually building an army of choice. 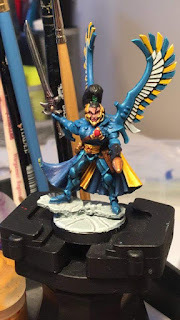 Although I still have a couple of outstanding hobby commitments (namely admech and imperial guard) I’m trying to move on to chaos stuff now and this seemed a good way to do it. My first fully painted model can be seen below. Another aside, I will share pics of my genestealer Cult army in a post soon. Back to business. 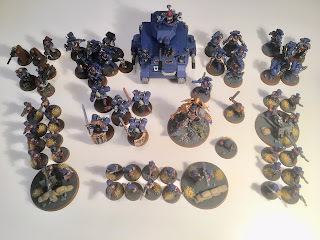 I chose this army as I wanted to paint a few marines to base standard and some imperial guard also. I’ve always loved the Mordian models and so though lt a small detachment of them would be great. In addition, I have the Guilleman model but have never used him in battle so now seemed a good time. Hence the ultramordians were born. It was a 1500 point battle and I think at this points level g-man, beast that he is, is a little too pricey relative to the overall army cost. I won one game and lost 2 (one of which was to the overall winner) but had a great day and feel I made a good achievement getting everything painted to tabletop standards. Cheers. Custodes today folks. I started out with a set from burning of Prospero and magnetised them to switch between options. The talons of the emperor boxed set seemed like such a good deal that I got a set except I sold on the static contemptor and got ahold of one of the snazzy fw ones to proxy, though now it seems you can use them anyway. A few more additions came along with advent of their glorious codex doubling the size of my force to what you now see. 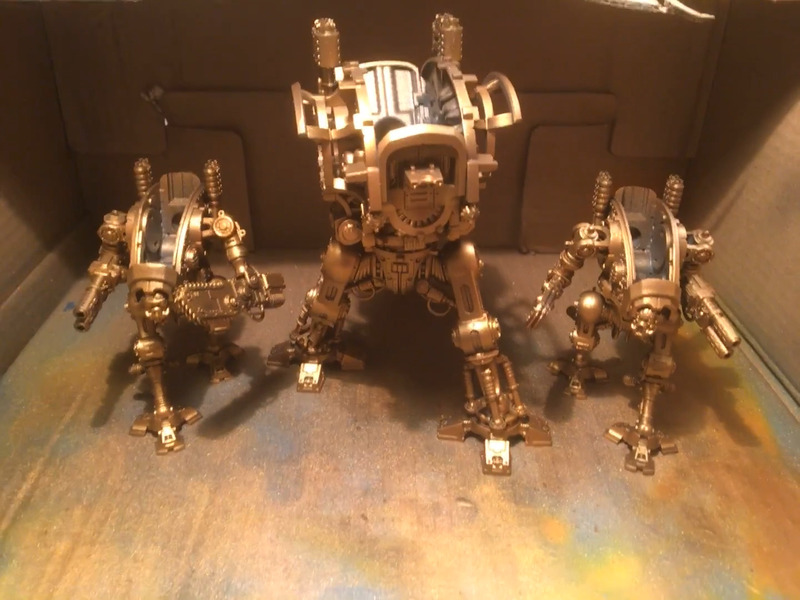 They’ve all been basecoated with the good spray except for the 5 original ones who were painted the same gold but then washed and highlighted. Originally I had intended on an industrial theme using sector mechanicus for the bases but now there are so many models of different base size in the army I decided to change themes and try something new in the form of a textured rolling pin of ancient ruins. I think it turned out pretty well - finished ones can be seen below. That’s the army for now. First few ventures with them have been fun and I hope to further expand them once the Forgeworld list becomes available. The new 30k shield captain and the hover tank are the items I’m eyeing up. Cheers. Hobby update (well it's about time) - Tau! Well, remember how I said this year would be about finishing off a few marine projects then getting stuck into other imperial/xenos things before turning to chaos about halfway through the year? It's kind of happening but as usual a bit more haphazard and slower than anticipated. The marine projects are all but at an end now and so I'm free to crack on with other things. These have been to build a few Imperial guard, get all my scenery assembled and base-coated and to get the Tau complete. I'm using the codex release schedule as a rough guide so expect a few necron characters and scarabs to get done over the next few weeks with dark eldar rebasing after that. For now though, here's what's been going on with the Tau. This army was started about a year after I got back into 40k (so around 10 years ago) as my first stint with 40k ended in 2nd edition before the Tau were dreamed up. I liked the concept and aesthetics of them and so bought a few of the army boxes. I've added to them gradually over the years - generally speaking by adding one of every release (plus the awesome Supremacy suit). I've a few models that I wish to one day add - namely vespids and shadowsun, but other than that they're done. One dilemma I have with them is that I can't decide between ochre and desert yellow as a colour scheme. Either way I won't give them any more colour until I have an airbrush setup, but they're ready for the tabletop now. Cheers.